Purple is a great color to use for a wedding. Most notably known for being the color of royalty, purple is both captivating and luxurious. There is something mysterious about the color, but it is definitely enchanting. Purple comes in many different shades, there is a shade for almost any occasion. A purple wedding theme in the spring or summer months should make use lighter shades of purple such as lavender or lilac. During the fall or winter months, deep rich shades of purple should be used instead. Purple looks good next to almost any color, so it's a pretty versatile color to work with. Your purple wedding theme can consist entirely of purple, using different shades of purple to contrast each other. Or it can be paired with a number of other colors. Popular colors to pair with purple include blue, pink, white and silver. 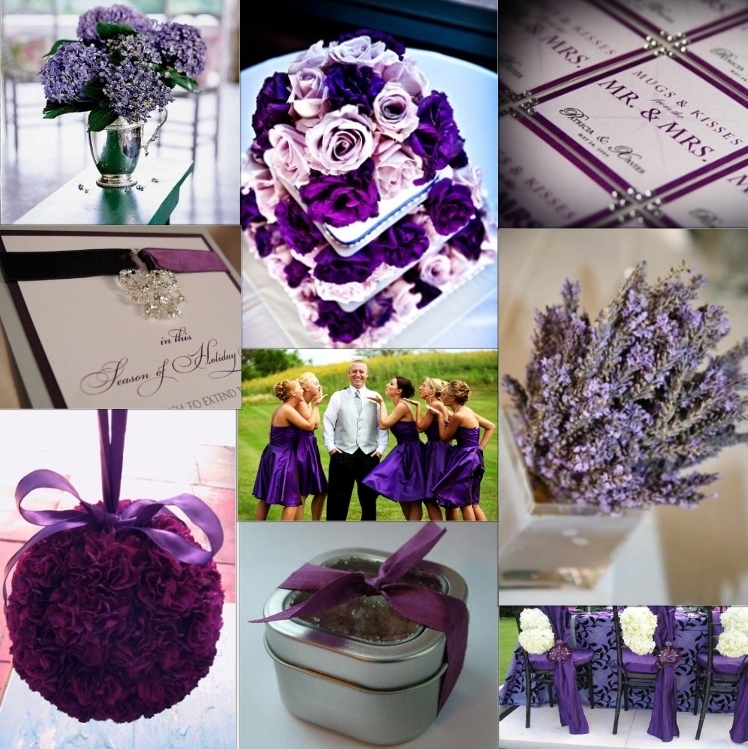 The bride can incorporate the color purple into her wedding day look in a number of ways. The most dramatic way to use purple is to wear an entire wedding gown in that color instead of a traditional white wedding gown. This look would work wonderfully if your purple wedding theme had a medieval twist. In order to look like a medieval princess on your big day, try to find a velvet purple dress to walk down that aisle in. If that style is completely out of the question for you, but you would still like to incorporate the color somehow, try to find some beautiful purple accessories to match your wedding dress. Try some amethyst jewelry or hair accessories. Whether they wear light or dark shades of purple, your bridesmaids will look like pure sophistication. Light purple dresses are perfect for an intimate garden wedding while dark purple dresses are more suitable for large fancy affairs. Another great thing about this color is that no matter what decade you are in, purple always seems trendy and will not go out of style. There are many purple flowers to choose from as well. 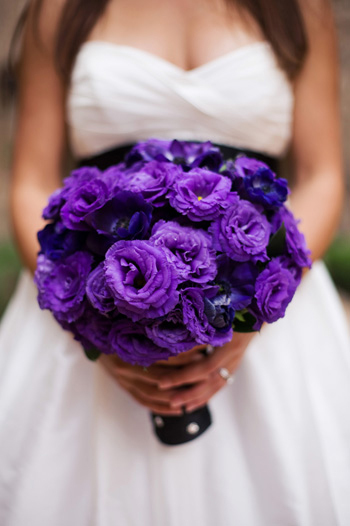 A purple wedding theme will not be complete without lots of purple flowers. Look for purple tulips, lisianthus, freesias, orchids, hydrangeas, lilacs, pansies, delphiniums or lavender. Pick your favorite purple flower and pair with other flowers in white, pink or red for a vibrant and whimsical bridal bouquet. Recreate the look for the centerpieces of your wedding reception. You will end up with a divine floral arrangement in the middle of each table. What's amazing about the color purple is that it's the perfect contrasting color to white. If your reception hall consists of tables with white tablecloth, adding purple place settings gives it just enough splash of color. A white wedding cake would look amazing with either light or dark purple designs. Add some silver for an added sleek and sophisticated look. There are plenty of creative ideas you can come up with using the color purple. Just let your imagination run wild, there are bound to be many decorative ideas to make your wedding memorable.